We flew out of Billund Denmark for the [solar] eclipse flight. A couple of days after the eclipse we flew to Cassablanca Morocco, where we were to join our 2 week excursion. 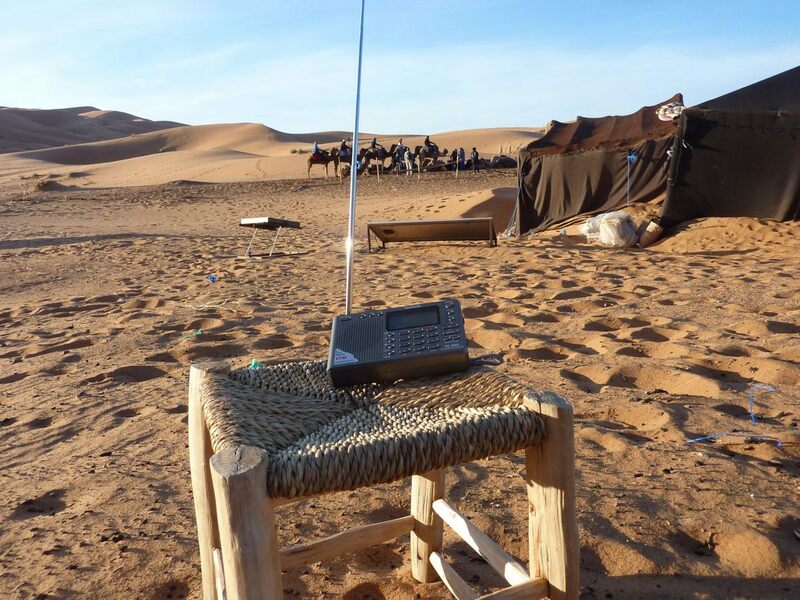 Here is a shot of the radio [above] at our camp in the dunes south of Erfoud in south central Morocco. In total we spent 2 1/2 weeks in Morocco and the desert was the nicest Radio quiet location I have been in. No interference what so ever! And lots of stations. It was great. The battery consumption of the PL-380 was very good. Nice unit. Many thanks for sharing your thoughts on the PL-380, Murray! It must have been bliss listening to the shortwaves in such an RFI-free area. Like you, I think the PL-380 is a brilliant travel radio and one I often recommend (click here for my travel radio review). I also travel with the Tecsun PL-310ET and the new CCrane CC Skywave--all great compact portables. This entry was posted in News, Radios, Reviews, Shortwave Radio, Travel and tagged best radios for travel, Murray, Tecsun PL-380, Travel Radios, Travel Shortwave on April 18, 2015 by Thomas. I just noticed that on the anon-co.com website that it looks like they have dropped the $7.50 shipping fee to the US for both the PL310ET and the PL 380. So shipping now is free for both radios. At $43.99 for the PL380 and $40.85 for the PL310ET you cant really beat a deal like that. I have had the PL310ET for a few months now, and it is really an excellent travel radio. My travel radio is the Tescun 390. It is a slightly larger version of the 380, with dual speakers. The speaker quality is not great, and having stereo speakers is a little silly. I usually use a headset. But the extra size allows for a longer ferrite rod, and since MW DXing is my favorite radio activity, this is important. So PL-390 has a longer ferrite rod than the other tecsuns? Is the MW reception better than the other mentioned radios? I haven’t made or seen a head-to-head comparison, but was convinced by the reviews that I read that it might be superior. I can say that I am really happy with it. The MW sensitivity, variable band width, and the ETS feature are winners.